Matsuri is a marvelous new game by Play n Go that has a lot to give to the players. This is because the game has 25 highly rewarding pay lines. In addition to the paylines, the game has a lot of other winning chances, bonuses and features for players to claim. The game has an exciting theme that players will surely enjoy. This is because it takes them to the Asian culture, into the Japanese festivals. This is clear from the title of the slot machine as Matsuri translates to Festivals. So players better be ready for a high paying ride that is immersive and engaging at the same time. 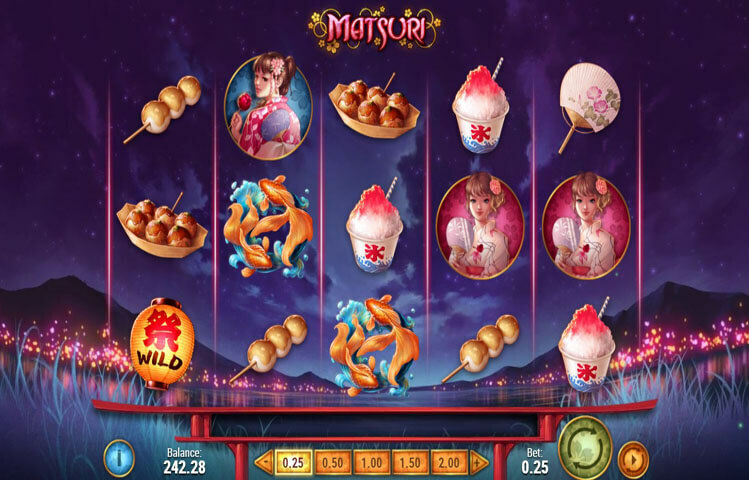 Matsuri is the brand new Play n Go slot machine. This new game is an advanced video slot that has 5 reels with a total of 25 wagerlines that players will be able to place their desired bets on. These bets can be placed right under the game’s reels at the control panel. Players will determine how much they want to place, from 0.25 to 100. After that, they will be able to initiate the game by spinning the reels once, or multiple times through the Auto Play function. Matsuri means Festival in Japanese. This is why the game has an Asian theme that invites players to enjoy the festivities and celebrations of the Japanese culture. Players will also get to claim their own share of the fortunes and the rewards that the Asian culture is well known for. You will be able to take their share of the fortunes through the 25 bet lines of the game, and the special features and bonuses that the game can offer. Players can find all about these prizes and features at the paytable of the game. The game’s theme is clear through the visuals of the game and its icons. These icons include two hot beautiful Japanese ladies wearing the kimono, golden fish, golden treasures and other aspects of the Asian Japanese culture and the festivities including masks. Matsuri, being a Play n Go powered game comes packing many special features and icons. The first one is the wild icon. This wild symbol is the ornate lantern. This lantern can replace other icons appearing on the reels, with the exception of the other special icons of the game. The other special icons include the scatter mask symbol and the bonus fish. Three of the bonus fish on the 3 middle reels of the slot would trigger the bonus round. Players will try to scoop these fish to claim prizes. As for the mask, it can appear on reels, 1, 3 and 5. When 3 of them appear on all 3 at the same time, players will claim 8 free spins with the chance to claim up to 20 as they get more scatters.